Hilgay Ely Road smockmill was probably built in the late 1700s and continued working until it was replaced by another smockmill on the same site c.1873. The mill ran two pairs of French burr stones and a dressing machine. The newer mill was a black 8 sided mill that had one pair of patent sails and one pair of common sails that unusually, rotated clockwise. The Ogee cap held an 8 bladed fan and was topped by a ball finial. The sails powered two pairs of 4ft 6ins left handed French burr stones and a dressing machine. The pair of patent sails were fitted after the mill was struck by lightning and caught fire, destroying one pair of common sails. The mill stood on a small mound and was connected to a granary in the basement via a tunnel. To be Sold by Auction By Messrs. Curle & Son At the Bell Inn, Hilgay On Thursday 8 September 1825 between the hours of 3 & 5 o'c. Lot 1. 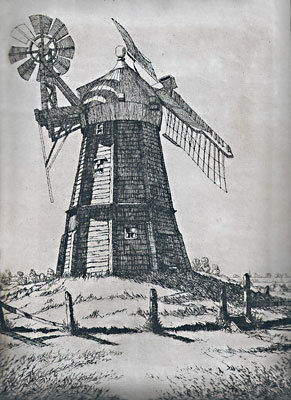 A Capital Freehold SMOCK WIND-MILL situate at Hilgay in the county of Norfolk, containing two pair of excellent French stones, regulators, centre irons, dressing machine, going gears & tackle complete, together with an excellent Dwelling house, stable, garden, orchard & mill yard containing together about one acre, in the occupation of Mr. John Bovell. The whole of the Premises are in excellent condition having lately undergone a thorough repair & ar eparticularly adapted for carrying on trade to avery considerable extent, being situate close tothe road side & contiguous to the rivers Ouse & Wissey. Further particulars may be had on application (if by letter post paid) to Messrs. Clarkson, Solrs. Essex Street, Strand, London, Mr. Micklefield, Solr. Stoke Ferry, Mr. John Bovell, Hilgay, Norfolk who will shew the Premises or the Auctioneer, Middleton, near Lynn. Subject to such Conditions as will be then and there produced. A Capital Freehold SMOCK WIND-MILL situate at Hilgay in the county of Norfolk, containing two pair of excellent French stones with tackle & going gears to the same belonging, together with a convenient dwelling house, stable and other outhouses in good conditoion with garden, orchard and mill-yard, containing together about one acre, late in the occupattion of John Bovell. And also a neat Copyhold Cottage standing in the said mill yard in good repair, with a garden to the same belonging. And also a Copyhold Messuage, shop, outhouses, garden and premises to the same belonging, situate in the street of Hilgay aforesaid, in the centre of the town, late in the occupation of Mrs. Rose Bovell. And also about 22 Acres of Freehold Meadow and Pasture Land, situate in Hilgay aforesaid. The above will be divided into lots for the convenience of purchasers. Particulars of which may be had upon application to Mr. Micklefield, Solicitor, Stoke Ferry, Norfolk, at the place of Sale, and of the Auctioneer, at Feltwell, in Norfolk. Mr. William Scott, of Hilgay aforesaid will shew the Premises. On Friday June 13, 1873 at 4 o'c in the afternoon, at the Castle Hotel in Downham Market. Comprising all that MESSUAGE with excellent Garden, Orchard, piece of PASTURE LAND, Outbuildings & the newly erected WIND-MILL containing two pairs of French grinding Stones & the customary going gear, holden for the several terms of 1000 years from the 21st day of June 1827, or 500 years from the 4th day of June 1756 or one of such terms, also that other COTTAGE & Garden held of the Manor of Wood Hall in Hilgay, as the same lies together & adjoining, situate in the Pits in Hilgay aforesaid, abutting on the Turnpike Road west, premises of Mr. Ambrose north, upon Church land east & upon land of E. Peel Esq. south. Apply to J. B. Murrough, Esq. Solr. 11 St James's Street, Bedford Row, London, H. B. B. Mason, Esq. Solr. Wereham, Stoke Ferry or the Auctioneers, Downham Market. To Let, a Tower Mill working two pair of French Stones and a good trade to be done, situated by the side of the main road & two minutes walk from the town. Stable, cartshed and piggeries adjoining. For rent etc. apply to Cook Morfoot, Cattle Dealer, Hilgay. Lot 2. All that excellent WINDMILL & fittings comprising two pairs of 4½ ft. French burr stones, sack lift, scales & beam, running gear, bolting machine etc. & COTTAGE with excellent Garden & piece of capital Pasture Land containing altogether 3r. 5p. abutting west upon the high road to Ely, south upon the property of E. Peel Esq. east upon the Church Lane & north upon Lot 1. Part of Lot 1 is held for the residue of a term of 1000 years from the year 1827 & the Cottage & part of the Garden attached are Copyhold of the Manor of Woodhall in Hilgay, the residue is Freehold. All persons having any claim or demand upon the estate of Mr. James Poll, late of Hilgay, retired miller & baker, who died on the 24th ultimo ... to send particualrs to us. The Whittome family also ran Hilgay postmill for several generations. Frederick Edward Whittome was living in Kings Lynn in 1972, when he contacted Harry Apling. He wrote that he had been born at Lime Tree House, which was built c.1900 and stood just to the north of the mill. Frederick Edward was the son of Frederick Whittome who died in 1966 at the age of 91, and the grandson of George Whittome. 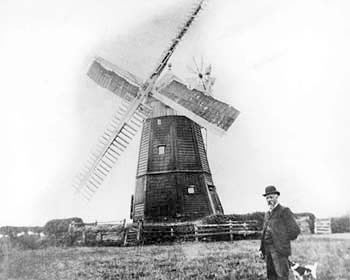 George owned the mill and lived nearby in Holt's Lane until he died in 1914. The mill ceased working c. 1913 and was demolished soon afterwards. A Mr. Tuddenham was mill foreman and the stone dresser and another of the employees was a Mr. Thurlow. The pair of patent sails were fitted after the mill was struck by lightning and caught fire, destroying one pair of common sails. The mill stood on a small mound and was connected to a granary in the basement via a tunnel. Frederick Edward Whittome wrote to Philip Unwin on 9th February 1973 and described how he saw the mill demolished in 1913. He reported that it was turned over by jacking up one side and it went over with a crash and in a great cloud of dust. My wife Anne Johnston's uncle George Frederick Arthur Tuddenham (1908-1998) described the mill, and visiting there at times - his father was a George Barnabas Tuddenham (1885-1960) who was a Metropolitan policeman when George Jr. visited his grandparents at the mill. The grandfather who was at the mill was Arthur John Tuddenham (1862-1921) along with his wife Charlotte Elizabeth Gorrad. Arthur Tuddenham was born in Whitwell, Norfolk, and died in the area of Downham Market. 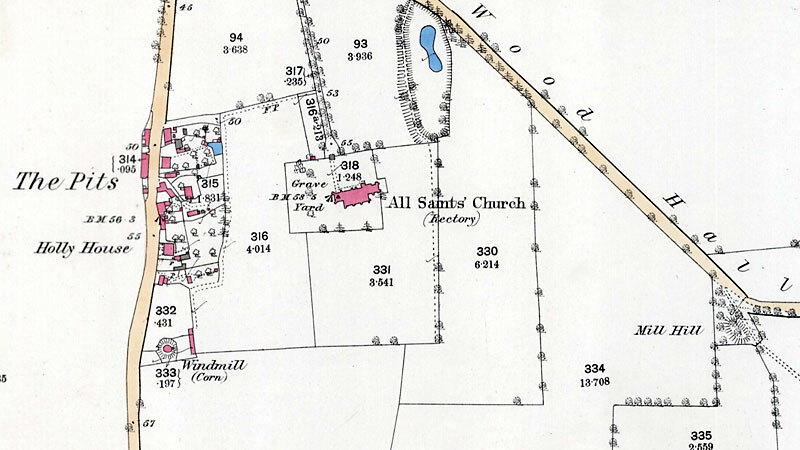 In the 1891 Census he was still in Whitwell, living at Bilhams Hill, and was listed as a miller at that time. His wife Charlotte was originally from Shimpling Parish, but they were married in Whitwell Parish Church 26 Sep. 1884. George remembered going to and from Downham Market, but he talked about this to me circa 1993, so unfortunately the details are not clear. Around 1913 George Barnabas Tuddenham took his family off to Ontario in Canada, settling around Strathroy. They eventually came to New Brunswick, and at one point returned to the UK. But George Frederick Tuddenham came back to Canada to marry my wife's aunt. No real details on the mill, I am afraid - but it does put a definite "person" to the Tuddenham mentioned in 1912. They also have the most successful waste transport business in the area, as well as a cottage winery business, and several other businesses. It has not been possible to accurately place all individual millers with a respective mill in Hilgay. It is also possible that in some instances two millers shared a mill. Whites 1864: John Whittombe, millwright & c.